If it’s all work, it won’t work. At this time a year ago, it was all I could do to hang on with both hands. I’d just taken a new job running the largest student housing facility in the country and some months before that, I’d started my own company, MammothCan, LLC. 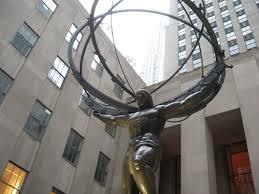 The strain of either one individually would have been worthy of Atlas, but both together? Even my “dad arms” were struggling mightily under the weight. I arrived at Knights Circle less than three months away from “TURN” where (for the uninitiated) we turn 60% or so of our rooms in the course of about two weeks. For Knights, that means about 1800 bedrooms. That’s not a typo – 1,800 rooms, over about 675 apartments. It’s the closest I’ve been to a real life D-Day moment and I suddenly pitied Eisenhower something fierce. At least no live rounds were being fired, just the usual figurative ones. On the other side, our fledgling company had contracts to do the painting for a pair of Orlando communities at the same time – something we’d never actually done yet. We planned, sketched, called, cajoled, innovated, and juggled dynamite, blindfolded, in an attempt to pull off both to great success. As I couldn’t be in two places at once, my enterprising wife stepped up to help the business while I waged war with the best on-site crew in student housing to make sure Knights was going to be golden. It damn near killed me. As long hours and working nearly 30 days straight took their toll, the fatigue piled on. Exhaustion tested me in every possible way. My physical health slipped and my ever-present optimism got the jimmy-legs. At the barber shop one evening before move-in day, I was reasonably sure I was experiencing a heart attack. My vision blurred, left arm tensed up, and I doubled over ready to pass out. Panic attack. It was just a panic attack. I’d never felt anything like it – drowning on dry land. What was that? And why hadn’t anyone else I’d known gone through something like it? Maybe they had, but these are the things we don’t talk about. Eisenhower never doubled-over. Patton would never hyperventilate. The hell? I’m happy to say Knights had the most amazing turn I’ve seen up close. For only having three months prep time, the plan worked nearly to perfection. Hiccups aside, it was a rousing success. MammothCan didn’t fare so well. We lost half the business we’d secured and took huge losses and learned some valuable lessons. That too, I’ll claim as a success of a different kind. This year, things are wildly different. Going into the second turn at Knights Circle, the team and I are beyond prepared. My turnover spreadsheet is a year older and has evolved over that time to provide us even more of a tactical advantage. The team is battle tested and old hat at the game. We’re so ready it’s almost disturbing. I’m doing better too. After turn last year I vowed to start taking care of myself more: actual exercise, better diet, and more sleep. Fewer hours too. Last summer I was working 55-70 hour weeks in preparation for turn, plus my efforts on the business after hours. It was too much. My kids hardly saw me and my wife got pushed to the edges. Not because I didn’t love them dearly, but because I didn’t know another way. Because this is what had to be done. Because I had to do it. I was wrong. I took yesterday off to enjoy a long 4th of July with the family and take them on a boat in Sarasota, my hometown. It was beautiful and fulfilling. After driving back to Orlando, my youngest asked me to make a “giant rocketship” with him out of blocks. I couldn’t wait. We made this, and it totally rules. This is what we made, in a true team effort. 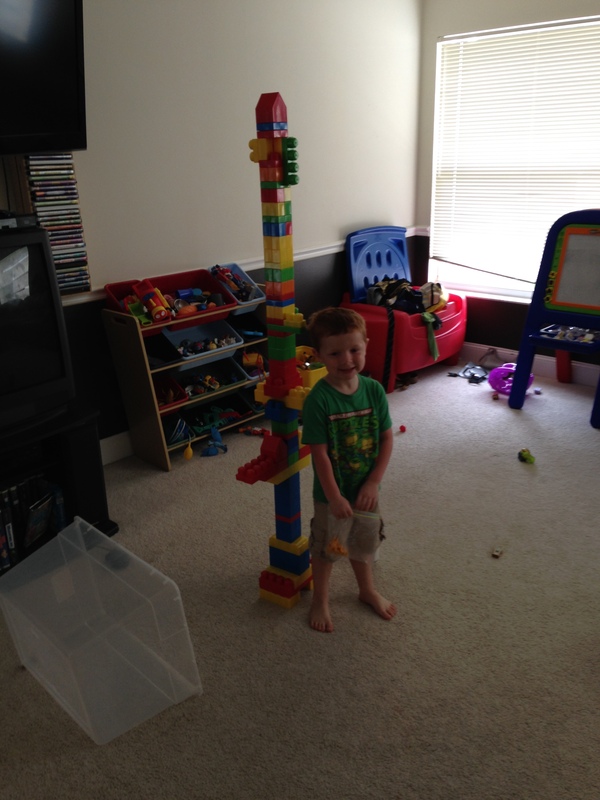 He was excited that it was taller than him and nearly “taller than daddy.” We took a picture for his mom while she was out running errands and he couldn’t have been prouder. This year, I’m prouder. Our challenge at Knights is just as big as before, but we’re beating a stellar last year, which I wouldn’t have thought possible. I’m spending more time with the boys and weekly date nights in with my wife, which have been a revelation. We’re closer, we’re really communicating, and we’re all significantly better off. It’s not an accident. You’re going to take on tough challenges and some much larger than others. Good! Don’t shy away from them by any means. Heroes are the ones that run towards danger when everyone else is running away. That doesn’t mean you have to sacrifice yourself in the process. Prioritize, compartmentalize, delegate, defer what can be deferred without wrecking the ship. Bring the thing into port, but don’t retrofit it into a casket while you’re at it. You’re no good to anyone that way and only you can find that balance between beaten down, and dead as a disco. Most importantly, if you’re feeling like no one’s been there before, they have. And you’re not alone. It’s ok to ask for help. It’s ok to explain what’s happening with you. It’s ok to leave on time every so often. Remember, if your life if is all work, it won’t work. The most important part of that quote is knowing that the help the universe is sending you, are all of the wonderful people in your life. A special thanks to all the wonderful, talented and wildly committed people I get to work with at Knights Circle, and to my amazing family for being there for me when I forgot to be there for myself. ← Do you know how to get there? Who cares?